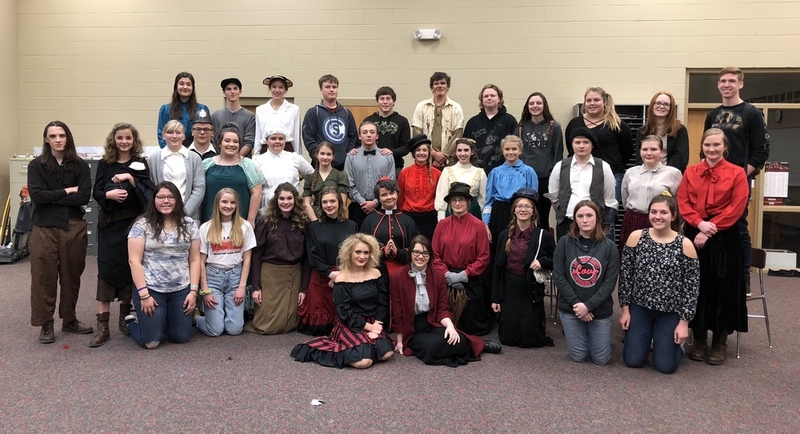 The Valentine One-Act team opened their season with a stellar performance at the Ord Festival on Monday, November 5. While this was not a competition, it was a great opportunity for the team to gain feedback and prepare for their first invitational. The following were recognized as Outstanding Performers in Ord: Tim Egelhoff, Elliana Springer, Jonah Perrett, Rita Woodraska, Grace Woodraska, Bradi Larabee, and Hanna Fischer. Tim was chosen as the Outstanding Actor for the day, and Elliana was selected as Outstanding Actress. Both students will receive medals. The group then attended their first competition of the season on Tuesday, November 13 at the Gothenburg Invitational. Amid tough competition, the group earned 5th place. Outstanding Performers in Gothenburg were: Bradi Larabee, Hanna Fischer, Tim Egelhoff, Calvin Stoeger, Kaylee Vavra, Rita Woodraska, Elliana Springer, and Faith Cox. The cast, crew, and directors invite you to attend their performance for the community on Friday, November 30 at 7:30 p.m. in the high school auditorium.